Since April of 2014, Brüeprint’s mission has been for people to enjoy a fresh, delicious beer together, and encourage family and friends to spend quality time face to face. Beer has always been at the center of civilization and social connectivity, and Brüeprint endeavors to take an active role in the local community and focuses on promoting traditional socialization. What makes us unique lies within the craft beer industry itself, where each brewery in our vibrant area puts its own personality into its brews. There's never been a better time to work together and share our craft. At Brüeprint, we strive for balanced, clean and refreshing brües, each carefully designed to fit your favorite gathering. We hope you'll invite us to be a part of your social circle! Before Brüeprint, I enjoyed a creative career serving communities as a process water treatment engineer. They say you can tell an engineer is an extrovert if they look at the other person’s shoes! I like to say hello with a smile and a handshake, a greeting better suited to making beer than treating water. This is why I took the leap of faith and made the transition to a path of yeast, love and hoppiness! Seeing our first patrons playing games, laughing and connecting confirmed I'd made the right decision and left me with a sincere fulfillment that continues today. Our staff will greet you with a smile and help you feel right at home. Our family at Brüeprint started from the world of engineering, and we put our skills and precision into bringing you some of the finest-tuned brües in the region. Brewmaster Brad Fogleman delivers consistently excellent brües that span from our traditional styles to the newest inventive creations in keeping with his scientifically exact process. Our sales and delivery teams have the technical background and service expertise to keep the Brües flowing at local establishments in central and eastern North Carolina, and our Cicerone-certified tap room manager will help guide your palate to happiness! And let’s not forget Tucker, who provides the security. 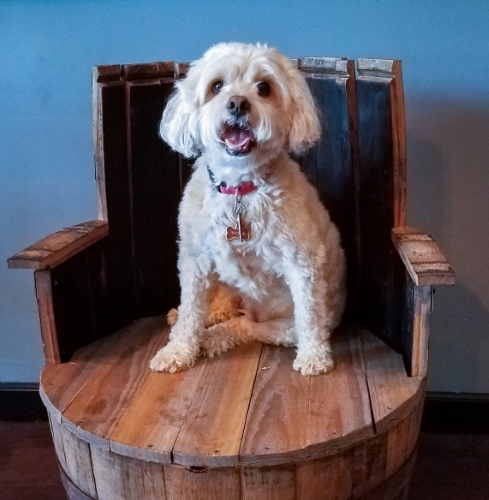 We are dog friendly for friendly dogs! Plan for a Great Time ……Grab A Brüeprint!